This station operates both voice and data communications. This station operates J2B for data and has special frequencies using J3E. Upper sideband ( USB) audio for voice. This station is now capable of the new Phone Patch system to provide telephone interconnect via VOIP for internet phone conversation. Info on the Brazil station coming soon! How do I is the best radio? If you would like to download this PDF - click here. You must have Adobe Reader to view this file. If you cannot view the file, you may not have a Adobe plugin for your browser, but downloading may work for you. CruiseEmail now uses new developed "CruiseEmail Software" called Commander. This new software will connect to all the CruiseEmail stations. 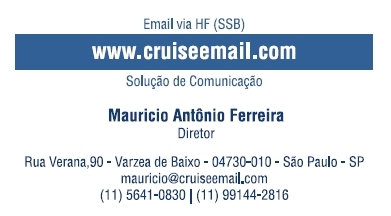 The software can be obtained when you sign up for CruiseEmail service and download the software from www.CruiseEmail.com. If you need assistance, contact the Research Facility by contacting CruiseEmail by phone 304 653 4661 or e-Mail to "sysop@cruiseemail.com".or w3ate@att.net. CruiseEmail will basically support all types of TNC's [Terminal Node Controllers]. You can register through the web site. This registration form with service agreement must be completed prior to connecting. Your e-Mail text subscription service is unlimited and can be used any time and not limited to a 24-hour day. Special detail weather information to specific areas, JPG's, and attachments. Tune to the assigned frequency and wait for a signal that can be heard from the station that you tuned. This signal sounds like a wobble sound. Do not transmit while you hear this signal; as you will interfere with another vessel. It is important to KEEP the speaker volume open while your connection is in progress. Operators at the CruiseEmail network control stations may need to get a message to you should there be some distortion on your signal. They are ready to assist you on the same operating frequency. The tuning signal will sound like warbling continuous tone lasting about 10 seconds. With your modem in USB mode you should be able to fine tune the radio so that the tuning bar on the modem shows the LEDS at the extreme ends of the LED scale illuminated. When your radio is properly tuned and no one else is transmitting, you may link to the assigned station. Once you have completed the registration form, you can now log on to send or receive traffic. Contact us today to get your service started! Please complete as many of the fields as possible, this will assist us in serving your needs better! Vessel name, your name, call sign, and email address are required fields. Please remember, the code is case sensitive! If code is unclear, hit the REFRESH IMAGE text and find one that is easier to understand. CruiseEmail provides a High Frequency Single Sideband service via a Public Coast Stations. This is not an Amateur Radio Service and your vessel FCC registration is required. The service includes continually yearly upgrades and 24/7 service support, unlimited time for sending emails for one year 12 month service. The CruiseEmail new non-modem service is $300.00 per year for unlimited transmission emails, and downloads for weather and navigation and sending email via internet services. For users using Pactor or TNC modems, service is $300.00 per year and $250.00 for a 6 month cruising limited permit for unlimited emails and data transmissions. Phone patch service is billed separately at a $50.00 deposit. Each phone connect cost is $5.00 for the first 5 minutes and $1.50 per minutes afterwards. This service is half duplex so that the full conversation cannot be monitored. Due to HF propagation on HF/SSB caused by the effects of sunspots and HF path probabilities, co-channel interference, modem problems, and the possibility of your radio transceiver being off frequency, along with any acts of "nature", CruiseEmail cannot guarantee reliability and uninterrupted communication. The end user acknowledges that HF/SSB communication with e-mail is an unsecured mode of communication when sending over the airwaves. Commencement of service: Service will begin within 1 to 24 hours after all registration and connection processes have been completed along with your payment. CruiseEmail reserves the right at any time to withhold and or revoke control of customers service for reasons not limited to poor operational practices, poor equipment technical specification causing interference of the operations of this station or its customers. Emails on HF-SSB multiple modems The article deals with over coming some of the issues with sending emails via SSB radios. Grounding Issues Grounding is Key to Good Reception. HF Radio Installation Procedures A detailed article on HF Radio Installations. RF Grounding for Marine Vessels RF Grounding for marine vessels. Download WIn 7/8.1/10 full install version 2.12.0 Download the client Win 7/8.1/10 software - FULL INSTALL! Download XP Full Install Only version 2.12.0 Download the client XP software - FULL INSTALL! Download Quick Start Guide for 2.0! Download the Quick Start Guide for 2.0! Download the PDF Help Guide for 2.11! Download the PDF Help Guide for 2.11! Download the MS Word DOC Help Guide for 2.11! Download the MS Word DOC Help Guide for 2.11!